"Even before I moved here, I was making work that was reminiscent of the desert." Emelie Richardson is a weaver and painter based in Chimayo, New Mexico. A graduate of the University of Kentucky with a BFA focused in painting and textiles, she has built a life in the high desert hills where weaving has been practiced and mastered for generations. In the summer of 2017 Emelie left Seattle, Washington, where she'd lived for nearly four years. After selling almost everything she owned and packing the rest into her small 1994 Volvo, she drove 1,500 miles south to Santa Fe. "I had lost all connection to Seattle, and was in the thick of heartbreak. I was planning on working for a few months and healing, and figuring out what was next." After researching Spanish-American weaving traditions, Emelie took a daytrip to Chimayo, where she wandered into Ortega's Weaving Shop. "I happened to catch Chris Ortega, who's a seventh-generation weaver, working on the loom. We talked for a bit, and he let me get up on his 54-inch loom, and soon enough we were discussing an apprenticeship. It's not something they really do, so I wasn't expecting to get a call back." Ortega's is a family-operated business. Established in 1918, they're renowned for the traditional Chimayo weavings their seventh- and eighth-generation weavers create. Their craft isn't often taught to people outside of the family, and most of their employees are family members or come from families with their own weaving lineages. Emelie did get that call back, and a year later she's deeply entrenched in Ortega's, weaving two to three days a week in their studio and working one day a week in the shop. "Being surrounded by the tangible family history, the stories and the traditions that exist on this land and within these buildings is incredibly inspiring. Weaving in the traditional Chimayo style, creating patterns and designs that have been woven for hundreds of years, physically connects me to weaving's roots in a way I'd not previously considered." Beyond the mentorship she has received from the Ortega family, Emelie has become an adopted part of it. "The Ortegas have taken me in as one of their own and have become beloved family to me. They've totally become my support system here." When she isn't weaving at Ortega's, Emelie is creating her own work. 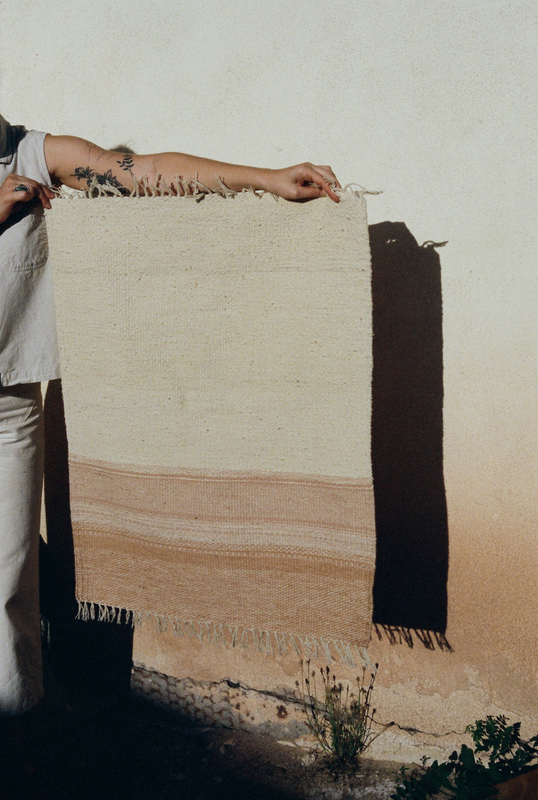 She tends toward neutral, naturally occuring palettes and hopes the next evolution of her work will see her including natural dye in her process. The pieces she creates on her walking loom at home are ethereal and abstract. Rose-toned geometric forms float along cream backgrounds accented with bits of cactus green and ochre. Some feature geometric shapes that mimic Southwestern architecture. Her weavings appear traditional and modern at the same time. "While the work I do at Ortega's has considerably influenced and strengthened my own practice, my art varies greatly in that I tend to take a looser, more abstract approach." In addition to her work at Ortega's, Emelie is creating a series of weavings based on paintings by John Zabawa for the El Rey Court in Santa Fe. Each takes an average of 17 hours to complete, and, somehow, she still finds time to dedicate to a series of her own. She calls it a love letter to the desert: "Most in this series are woven with locally handspun raw wool with accents of naturally dyed, neutral yarn." Emelie uses weaving as a form of catharsis. She works through periods of pain, and sees a medicinal quality to her creativity. "I think it's absolutely necessary for me to work during emotionally trying times. It's not always the easiest thing to do; I'd much rather just sit and wallow. But as I've gotten older, I've realized how important it is to just do the work, and how essential that is for healing as well." In this life, we cannot see the path before us. We don't know what’s coming, or if the decisions we're making are the right ones, and that can be terrifying and keep us from making big moves. Emelie's move to New Mexico forever changed her life and work for the better. This is a story about the reward that awaits you on the other side of a leap of faith.